Members of Ipswich Choral Society took part in the Remembrance Sunday service at the Ipswich Cenotaph, 11 November 2018. Despite rain earlier in the day, there was glorious sunshine for the service in Christchurch Park. Ipswich Choral Society were proud to be involved, providing the musical accompaniment for the laying of the wreaths. There are further details and stories of other Ipswich servicemen and women who lost their lives in the First World War and subsequent conflicts at the Ipswich War Memorial Website. your family, you may be interested in visiting Every One Remembered Website, run by the Royal British Legion and Commonwealth War Graves Commission. Ipswich Choral Society is keen to support local charities, both financially with fund-raising events and by raising awareness amongst ICS members and concert audiences. Our chosen charity for 2018 is the Ipswich and District Support Group, Diabetes UK and we will be helping raise awareness at our Bernstein Centenary concert on 20 October. The Diabetes UK Ipswich and District Support Group is one of over 350 voluntary groups situated throughout the UK. The group was launched in March 2015. Their goal is to provide support and educate people living with diabetes as well as their family, friends and anyone else who are interested in knowing more about type 1 and type 2 diabetes. Regular open events are social gatherings for people who have Type 1 or Type 2 diabetes to have the opportunity to talk to those in a similar situation and receive support. Family and friends are most welcome to come along, with the added bonus of refreshments available free of charge with no admission charge or joining fee! Support and companionship are some of the simplest yet most important aspects of living with diabetes – this is why the Ipswich and District Support group exists and want to help in any way that they can. Would you consider to be a Group Support Helper? Ipswich and District Support Group are currently looking for volunteers as the group goes from strength to strength. Dealing with more requests for providing awareness events within the local area, help is required for these events. Ipswich Choral Society will mark the centenary of the end of the First World War, in collaboration with creative groups from Ipswich, combining music, dance, poetry and animation to create an immersive, thought-provoking and moving performance on Saturday 17 March 2018 in the iconic Ipswich Town Hall. We will learn about the personal stories of Ipswich people, both at home and on the front lines, leading up to and during wartime. Independent Dance Artist and Choreographer Mary Davies has been commissioned by Ipswich Choral Society to direct the dance performance and is calling out for community dancers and enthusiasts of all ages and abilities to take part in this unique opportunity. If you missed the Taster workshop on Sunday 12 November, don’t worry – you can still be a part of this exciting project! If you are free to attend the dates below, we invite you to join us at the first stage of our creation. Please note you will not be needed for the entirety of each weekend rehearsal. Please email karenlouisedance@gmail.com to register your interest or to find out more details. Download the PDF flyer here. “Ipswich Remembers” is supported by Arts Council England National Lottery funding. https://i2.wp.com/ipswichchoralsociety.org/wp-content/uploads/2017/11/Ipswich-Remembers_header.jpg?fit=1373%2C572&ssl=1 572 1373 admin https://ipswichchoralsociety.org/wp-content/uploads/2017/04/ICS-logo-blue_300_web-298x300.jpg admin2017-11-21 16:36:402017-11-21 16:46:37Calling all dance enthusiasts! 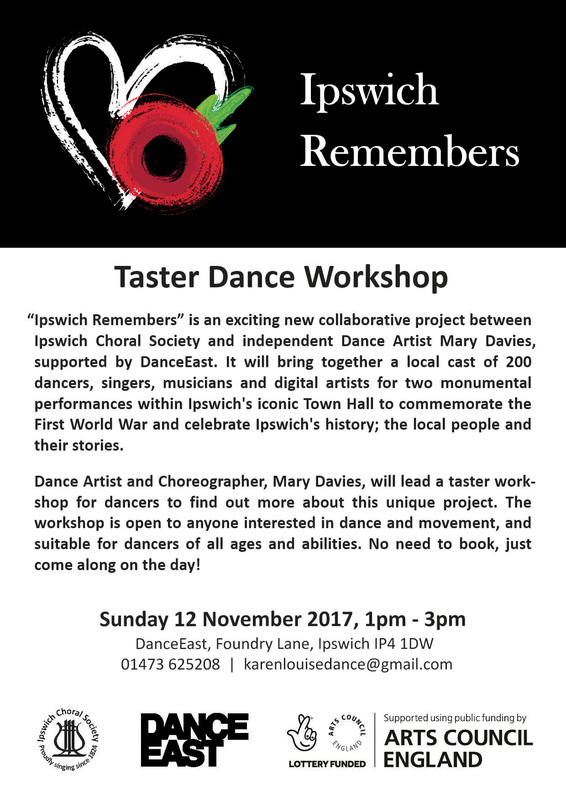 “Ipswich Remembers” is an exciting new collaborative project between Ipswich Choral Society and independent Dance Artist Mary Davies, supported by DanceEast. It will bring together a local cast of 200 dancers, singers, musicians and digital artists for two monumental performances within Ipswich’s iconic Town Hall to commemorate the First World War and celebrate Ipswich’s history; the local people and their stories. Dance Artist and Choreographer, Mary Davies, will lead a taster workshop for dancers to find out more about this unique project. The workshop is open to anyone interested in dance and movement, and suitable for dancers of all ages and abilities. No need to book, just come along on the day! For more information, email Karen Pratt karenlouisedance@gmail.com or telephone 01473 625208. Ipswich Choral Society is keen to support local charities, both financially with fund-raising events and by raising awareness amongst ICS members and concert audiences. Home-Start East Ipswich & Coastal has been chosen as our nominated charity for 2017. Look out for collection buckets at Ipswich Choral Society concerts and events.